The SLAM problem is known to have a special property that when robot orientation is known, estimating the history of robot poses and feature locations can be posed as a standard linear least squares problem. We have developed a SLAM framework that uses relative feature-to-feature measurements to exploit this structural property of SLAM. Relative feature measurements are used to pose a linear estimation problem for pose-to-pose orientation constraints. This is followed by solving an iterative non-linear on-manifold optimization problem to compute the maximum likelihood estimate for robot orientation given relative rotation constraints. 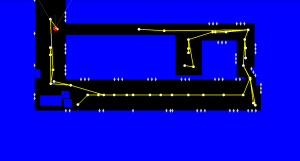 Once the robot orientation is computed, we solve a linear problem for robot position and map estimation. 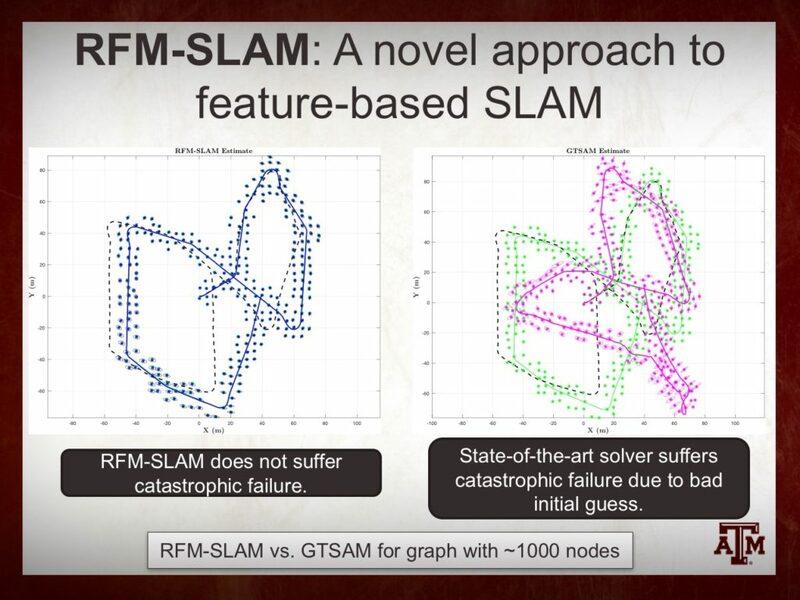 Our approach reduces the computational burden of non-linear optimization by posing a smaller optimization problem as compared to standard graph-based methods for feature-based SLAM. By separating orientation estimation and formulating the robot and landmark position estimation as a linear least squares problem, no initial guess is required for the positions. Further, empirical results show our method avoids catastrophic failures that arise in existing methods due to using odometery as an initial guess for non-linear optimization, while its accuracy degrades gracefully as sensor noise is increased. FIRM Planner. A view of the robot’s mind. 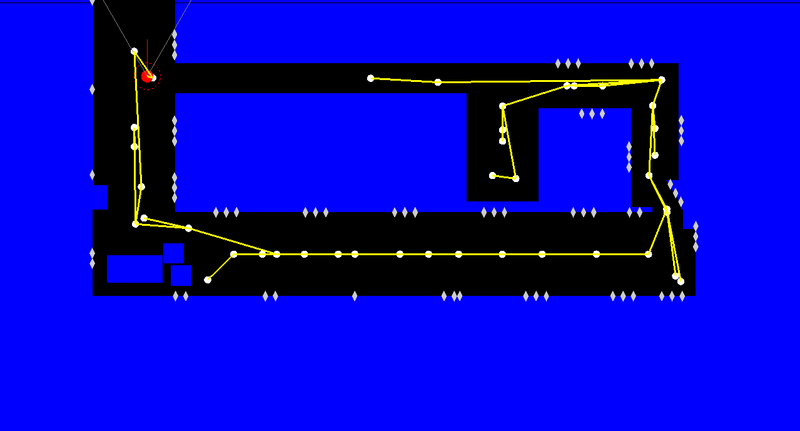 The blue regions are occupied (obstacle) and the black regions are free. The white diamonds are landmarks in the environment. The yellow edges show the feedback generated by FIRM. Notice that it guides the robot through the back door since it has more information. 3. Modelling uncertainties i.e. our physical models of the system and environment usually have approximations/errors. Thus, all these uncertainties call for a new class of motion planners, planners that can reason about the uncertainty in the system and then make smart (optimal) decisions. In the absence of exact state of the system due to sensing uncertainty, the robot forms a probability distribution over all possible states (referred to as belief) and the planning and decision making has to happen based on the available belief of the system. However, motion planning in the belief space is a challenging problem due to the computational intractability of its exact solution (it can be classified as a Partially Observable Markov Decision Process). This problem becomes even more challenging in changing environments as the robot needs to reason not only about its own state but about external disturbances such as moving people and unforeseen obstacles (furniture, doors etc.). Research conducted at the EDP Lab and Parasol Lab at Texas A&M University and recently joint work with MIT has resulted in an innovative solution called FIRM (Feedback-based Information Roadmaps) that is able to transform the intractable POMDP problem to a graph based structure in belief space. FIRM essentially constructs a roadmap graph in belief space and is able to generate feedback policies and give guarantees on the minimum success probability for a planning task. FIRM generates a policy that is able to guide the robot through paths that minimize the localization uncertainty and collision probabilities. Thus, FIRM provides motion plans that are able to deal with uncertainties in our systems. Further, FIRM is also capable of dynamic replanning in real-time to deal with unforeseen changes in the environment and robot’s state (kidnapping). We have successfully applied this method in simulation and on real physical robots and demonstrated its robustness in realistic scenarios. Here is a video that shows FIRM running on an IRobot Create that is tasked with visiting multiple goal locations sequentially in an everyday office environment. The goal points are not predefined and submitted by user online. Notice that there are people walking, doors are opened and closed randomly and the robot is kidnapped to unknown locations. Our robot is able to handle all these challenges and accomplish its mission! Further, we are now linking FIRM with OMPL. You can currently download a working simulation of the FIRM graph construction from github. Please visit the Software page for more information.